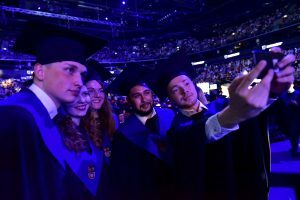 The Graduation Ceremony of the 95th graduating class of Kaunas University of Technology will take place on Tuesday, 22 June 12pm at Žalgiris Arena (Karaliaus Mindaugo Avenue 50, Kaunas). The diplomas will be awarded to the Bachelors and Masters of the Faculty of Chemical Technology, School of Economics and Business, the Faculties of: Informatics, Mathematics and Natural Sciences, Mechanical Engineering and Design, Civil Engineering and Architecture, Social Sciences, Arts and Humanities. Also, the diplomas will be awarded to all the graduates of doctoral studies. The organisers of the event have prepared an exciting and exceptional programme full of surprises. It is expected that the event will end in 3pm. On the same day the diplomas will be awarded to the Bachelors and Masters of KTU Panevėžys Faculty of Technologies and Business. The ceremony will take place at J. Miltinis Drama Theatre (Laisvės Avenue 5, Panevėžys).